NSIS is a well known system used to create Windows installers for any type of application based on scripts. The problem is that only Windows binaries are officially provided to compile this kind of scripts. This can be a problem in a continuous integration environment, where continuous integration servers use to be Linux based. At this article I am going to explain how to compile NSIS source code in Linux to get it working there and allow it to be invoked from automated tasks run in a continuous integration server. The first step is to download the windows distributable zip file and the source code. Both of them can be downloaded from their Sourceforge project: https://sourceforge.net/projects/nsis/files/?source=navbar. Now that we have downloaded both windwos distributable package and source code we are going to decompress them creating two folders, nsis-2.46 and nsis-2.46-src. All of this tools can be easily installed from repository, and probably we already have some of them. Anyway, I uploaded the DEB resultant package for you to download it. Once all the requirements are clear we are going to compile the NSIS binary that is responsible for interpreting the scripts, the so called makensis. We have to be at the source code directory, in my case /home/alejandro/nsis/nsis-2.46-src, and we execute this command. Notice that install-compiler is an argument of the command that is placed at the end, and is not part of the distributable path. 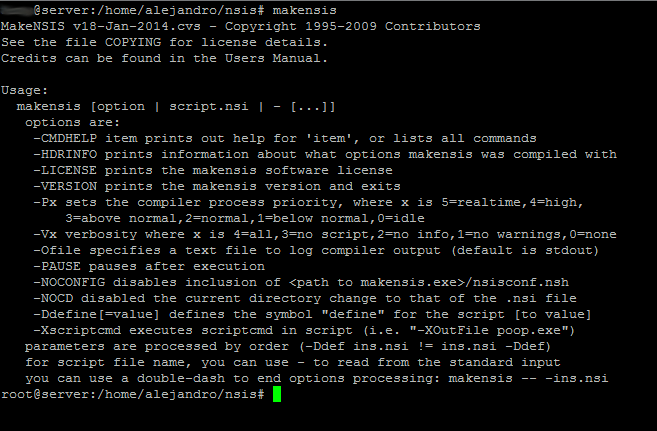 The execution of this command will compile the code, generating the makensis binary at the bin directory inside the distributable package folder, in my case /home/alejandro/nsis/nsis-2.46/bin. Now that we have makensis created its a good idea to make it available from anywhere, for example adding it to a bin directory, and make sure it can be executed. Using the paths from our example, running this commands will make the job. Now it is time to test the command. Running makensis from anywhere should output something like this. If we have an nsis script, runing the command makensis /path/to/script.nsi will compile the script, creating the installer. The syntax is the same used in windows. Atention! While running this command there could be this error. This could happen because of a path error, but solving it is very simple, just go to the NSIS distributable folder, /home/alejandro/nsis/nsis-2.46 in my case, and create the folder share [mkdir share], go to that folder an create a symbolic link running ln -s /home/alejandro/nsis/nsis-2.46 nsis. With this easy steps we have now a NSIS compilation system under a Linux machine ready to build and deploy Windows installers. © 2019 Alejandro Celaya Alastrué.